In February through April of every year, millions of Americans will be filing their taxes and receiving sizeable refunds. Reduce your credit card debt. It is difficult to build wealth if you are paying 20-30% interest on credit cards. There are few better uses of your tax refund than paying down your high interest rate debt. You can use the Resources section of BaronSeries.com to obtain your free credit report and find the fastest way to pay-off your debt. Through April 15th, individuals are allowed to contribute up to a $4,000 ($5,000 if you are age 50 or older) to an IRA for tax year 2007. If you are unable to make the April 15th deadline, you can make your 2008 contribution with it instead. For 2008, individuals are allowed to contribute up to a $5,000 ($6,000 if you are age 50 or older). For many parents and students, the cost of higher-education has become increasingly difficult to manage. According to the College Board, tuition and fees at public colleges and universities have increased 51 percent on an inflation-adjusted basis over the last 10 years. 529 plans can be a great way to begin saving for your childrenâ€™s college education. Some states even offer an income tax deduction for residents who contribute to a 529 plan. 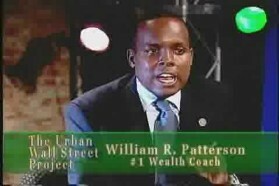 Ranked as the #1 Business Motivational Speaker by Ranking.com, William R. Patterson is a four-time award-winning lecturer, national best-selling author, and wealth coach who uses his trademark approach, THE BARON SOLUTIONâ„¢, to coach, train, and motivate business leaders, sales professionals, entrepreneurs, and investors. His breakthrough book, The Baron Son, has been translated around the world and featured in the Forbes Book Club. William is an internationally recognized business authority who has been a featured guest on over 1,000 television and radio programs. Williamâ€™s website, BaronSeries.com, is also winner of three 2008 Web Awards including Best Wealth-Building Site. THE BARON SOLUTION integrates over 250 proven business and financial accelerators to help you rapidly achieve your personal and organizational goals. To reach any significant level of success, every small business owner should have a business coach to help them avoid many of the hurdles and pitfalls that exist and rapidly build their business with integrated turnkey solutions. If you have the goal of building a "million-dollar business," it is important to clarify whether you are talking about a million dollars in revenue, earnings, or owners' equity. They mean different things and can be achieved with different strategies. From a planning standpoint, your business model and exit strategy are important factors that will determine the speed at which you can build your business. There are many entrepreneurs who are not looking to create sustainable businesses, only companies that they can eventually sell to larger players in the competitive space. This requires a different level of skill and planning than a sustainable business.It is also important to clearly define your exit strategy when you start your business, and whether you will "cash out" of that business by automating it, creating franchises, an acquisition, Direct Public Offering (DPO), Initial Public Offering (IPO), etc.One option for quickly creating a million-dollar business is to take your idea and develop it into a proven business model, then sell stock to accredited investors. This gets you to a million dollars in capitalization without necessarily having the revenue or earnings to support it. As you saw during the dotcom era, there were lots of businesses with billions of dollars in capitalization and little-to-no earnings. This is great for the founders and investment bankers, but does not mean much for new shareholders. It also becomes a lot quicker to get to a million dollars in capitalization, revenue, or earnings if you are doing large deals and selling high price, high margin products and services. BaronSeries.com is ranked as the number one business motivational speaker website by Ranking.com. National best-selling author and business coach William R. Patterson is helping thousands of entrepreneurs and investors around the world build wealth with his Baron strategies for financial independence. BaronSeries.com continues its 2007 winning streak, capturing three 2008 Black Web Awards: Best Wealth-Building Site; Best Male Author Site; and Best Lecturer, Speaker and Workshop Site. In 2004, William R. Patterson, national best-selling co-author of "The Baron Son," launched BaronSeries.com. He developed the Web site for The Baron Solution Group to deliver coaching and consulting services to executives, entrepreneurs, investors and success-minded individuals. The Baron Solution coaching and training program is operating in one of the most difficult financial and political environments in over two decades. Yet Patterson and his team have been able to increase the revenues of clients twenty percent on averageâ€”and in some instances, double revenues in less than one year. Patterson achieves these results by applying The Baron Solution proprietary method, which includes over 100 business and financial accelerators. By helping clients scale their businesses, Patterson has also positioned them to raise millions of dollars in private equity and venture capital funding. "Many small businesses and individuals are in dire straights as a result of losing access to capital or their life savings in the stock market crash of the late 90's," Patterson says. "Others face the prospect of losing their homes as a result of the recent sub-prime lending crisis or are simply looking for realistic and ethical ways to accelerate their success. We are just glad to be able to help people." Patterson was recently honored during the Founder's Day celebration for Sigma Gamma Rho Sorority, Incorporated for his work teaching financial skills to students in urban schools and teen mothers. "We have made great strides in improving the success rates of small businesses, but we are also committed to youth programs and community service," Patterson says. He conducts The Baron Solution national pro bono youth workshop series to help children develop financial and business skills that are not taught in school. He also developed a personal finance and entrepreneurship curriculum for Kâ€“16 students. Over 650,000 votes from 130 countries were cast to decide the 2008 Annual Black Web Awards winners. 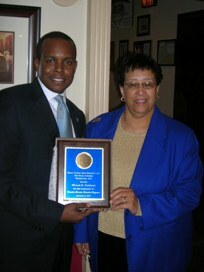 In 2007, Patterson won a Black Web Award for Best Lecturer, Speaker and Workshop Site. "To be recognized for excellence in three diverse categories is a great honor," Patterson says, "particularly when nominated among esteemed industry peers such as Dr. Michael Eric Dyson, Dr. Randal Pinkett [winner of Donald Trump's "Apprentice"], Iyanla Vanzant and Black Enterprise magazine." Black Enterprise praised Patterson's work with a glowing review of "The Baron Son," calling it "a compelling way to reveal how wealth-building strategies apply to everyday living." Patterson has also received endorsements from notable business leaders such as billionaire Founder of Black Entertainment Television, Bob Johnson, management expert, Tom Peters, and Chief Marketing Officer of The Nasdaq Stock Market, Inc., John L. Jacobs. 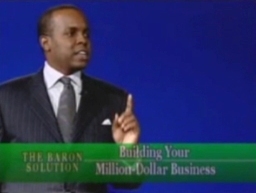 Prior to winning three 2008 Black Web Awards, BaronSeries.com was ranked as the number one Business Motivational Speaker Website by Ranking.com. William R. Patterson is the Founder and CEO of The Baron Solution Group. He is a four-time award-winning lecturer and national best-selling co-author of "The Baron Son." He is an internationally recognized business authority who has been a featured guest on over 1,000 television and radio programs. For more information, visit: http://www.baronseries.com. 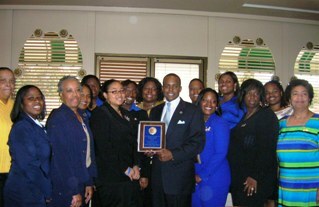 William R. Patterson Honored by Sigma Gamma Rho Sorority, Inc.
William R. Patterson is honored during the Founder's Day celebration for Sigma Gamma Rho Sorority, Inc. for his work teaching financial skills to students and teen mothers. "We have made great strides in improving the success rates of small businesses, but we are also committed to youth programs and community service," Patterson says. He conducts The Baron Solution national pro bono youth workshop series to help children develop financial and business skills that are not taught in schools. He also developed a personal finance and entrepreneurship curriculum for Kâ€“16 students. William R. Patterson, co-author of the National Best-selling business and personal finance book, "The Baron Son," accepts the Black Web Award for Best Lecture Speaker and Workshop Site. For more information, visit www.baronseries.com. Join National Best-selling authors Vicky Therese Davis, William R. Patterson, and D. Marques Patton for THE BARON SOLUTION 5-Week Entrepreneurship Teleseminar. It's a content rich experience where you will discover detailed, practical ideas for building wealth through a small business, and using online and direct selling. You will learn strategies that have won countless executive distinctions and received praise from many top business leaders, sales professionals, and entrepreneurs, as Vicky, William, and Marques share their unique entrepreneurship model for achieving financial independence using the "Supreme Principles" outlined in their National Best-selling book, THE BARON SON. THE BARON SOLUTIONâ„¢ Minute is a weekly video and audio vignette offering invaluable business, personal finance, and success information based on the National Best-selling book, "The Baron Son" by Vicky Therese Davis, William R. Patterson, and D. Marques Patton. THE BARON SOLUTION Minute is a weekly segment on "The Louie Jones Show" and "All Things Literally." For more information visit: http://www.baronseries.com. VICKY THERESE DAVIS, WILLIAM R. PATTERSON, and D. MARQUES PATTON are co-authors of the business and personal finance National Bestseller, "The Baron Son: Vade Mecum 7." Vicky Therese Davis is Founder and Chief Executive Officer of Indulgence Jewelry Corp. William R. Patterson is Chairman and Chief Executive Officer of the Warcoffer Capital Group, LLC. D. Marques Patton is President and Chief Operating Officer of The Warcoffer Capital group, LLC. 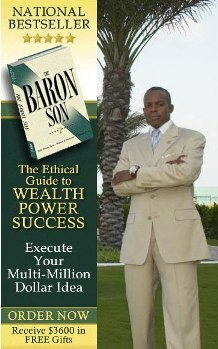 Their ethical guidebook to wealth, power, and success, "The Baron Son," has been translated around the world and featured in the Forbes Book Club and Black Enterprise magazine. THE BARON SOLUTION GROUP conducts a series of business and personal finance workshops for adults across the U.S. and abroad based on the strategies outlined in "The Baron Son." Davis, Patterson, and Patton also conduct a national series of pro bono workshops for children and teenagers teaching business and personal finance skills. For more information and tour dates, please visit: www.baronseries.com. WILLIAM R. PATTERSON appears on "Chicago Speaks" on V103 102.7 FM with Les Brown to discuss The Baron Son and "Developing Financial and Entrepreneurial Skills in Young Adults." WILLIAM R. PATTERSON appears on NewsChannel FM 105.5 to discuss The Baron Series and "Developing Financial and Entrepreneurial Skills in Young Adults." "An enlightening 'how-to' book that is a must-read for people who are seeking to enhance their value and leadership skills to the max." William R. Patterson's discussion and signing of The Baron Son at A Good Book in Baltimore, MD. William R. Patterson appears on The Big Biz Show on World Talk Radio to discuss "Developing Financial and Entrepreneurial Skills in Young Adults." Wealth coaches Vicky Therese Davis, William R. Patterson, and D. Marques Patton are helping thousands of young people across the U.S. conquer debt and build wealth with their breakthrough strategies for financial independence. William R. Patterson's business panel discussion, financial workshop, and signing of The Baron Son at The Harlem Book Fair in New York. William R. Patterson's financial workshop and signing of The Baron Son at Hue-Man Book Store & Cafe in New York. Founder, Black Entertainment Television, Inc.
"Everyone can benefit from the road map this book offers." Chief Marketing Officer, The Nasdaq Stock Market, Inc.
National Bestselling Co-author William R. Patterson will appear on Everyday Finances with Everyday People on NBBTA Radio on Saturday, April 8th to discuss The Baron Son and THE BARON SOLUTIONâ„¢ national business and financial workshop series. National Bestselling Co-author William R. Patterson will appear on The Louie Jones Show on WCFJ AM 1470 in Chicago on Sunday, April 9th from 6:30 - 7:30PM CDT to discuss The Baron Son and THE BARON SOLUTIONâ„¢ national business and financial workshop series. It is no secret that the performance of personnel is the largest contributing factor to the long-term success of any organization. Managers may give direction, but in the end, it is the companyâ€™s staff that determines how well it executes. It is the staff that must respond to the threat of competition and the shifting interests of shareholders and consumers. Taking this into consideration, one of the greatest challenges facing managers is motivating their personnel to achieve outstanding performance. Whether you are a first-time or veteran manger, these simple strategies will serve as a primer to put you on the right track. Direct your staff to model the behaviors of their well accomplished colleagues. The more you and your staff are presented with these positive archetypes, the more likely they are to model that behavior and exhibit the high performance you seek. This applies internally and externally, on a group and individual level. In addition to being modeled from outside sources, successful techniques should be shared by different groups within your organization. In order to perform at peak level, your staff must know the details of the methods that bring results. Take time or set up meetings to share success stories where your staff can share their most effective strategies. The Law of Expectation plays a key role in managing people. Simply stated, it says, â€œIn life, you get what you expect.â€� So, expect the best from your staff in order for them to perform at a high level. Given the proper resources and direction, good people will perform at your level of expectations. As someone they respect, the more you believe in their ability, the more they will believe in their own ability. Confidence breeds confidence and success breeds success. Responsibility given to the right people will communicate a message that you expect more of them and they will perform to reach that level of greatness. Employees should know at all times what they are striving toward and being held accountable for. It is important that your team has clearly defined goals set at the beginning of any evaluation period. There is nothing as disheartening as being evaluated without being given prior written goals. Also important to note is that goals assigned to employees should be attainable and influenced by factors within their control. You should support your staff by providing them whatever resources they may require for the attainment of their objectives. Incentive programs should encourage behaviors that benefit the organization and promote its mission and values. They should offer enticements for employees to launch new initiatives that will directly or indirectly boost morale, generate revenue, and reduce expenses. Incentive programs work to create a corporate culture that promotes initiative, teamwork, and the generation of ideas for productivity enhancements. They assist in fostering the development of new business, as well as the projects that affect the bottom line. As the old saying goes, â€œYou get more from what you encourage and reward.â€� Management is no exception. Reward and Recognition programs apply when projects have been completed. To be effective, R&R programs must be genuine and equitably applied. One way to ensure this is by having recognition that comes from your staff, not the top ranks. Employees should select those deserving recognition, not managers. It should be a system with defined metrics that all employees can measure their performance against. It is then a system based on objective accomplishment, not one based on the subjective choice of management. Another effective R&R technique is to reward teams over individuals. This creates an environment of teamwork, rather than competition. The most effective R&R programs are those that offer ownership to their staff. Nothing will motivate people like a good leader. Good leaders foster the ideals of trust and interdependency, as well as they lead by example. By leading from the front lines they demonstrate their knowledge, vision, and experience, and command the respect of their teams. They show an understanding of their business and personnel. Their level of knowledge and ability to relate to others command respect; they would do anything for their people. Education is one of the best ways to motivate under-performing personnel. No employee or associate wants to feel they have plateaued in their work environment. By offering coaching programs, you communicate your concern for personnel development. You also offer new skills for your workers to implement and build upon in carrying out the organizationâ€™s mission and objectives. Another powerful way to motivate your staff is to reinforce the importance of their daily activities. It does not matter if the function performed seems small; it contributes to the overall efficiency of the organization. Help them understand that they are doing something vital, that they are helping people or changing an industry. Give them something greater to strive for. Anything done with meaning and purpose will be far more effective, and therefore more powerful, than things done without their efforts. Allow your employees the freedom to create. Encourage them to devise new ideas and show them how those ideas will be respected. Micromanaging is one of the quickest ways to breed resentment from your staff and communicate that you do not trust their ability. Giving proper guidance entails communicating the desired objective, directing your team to resources to help get the job done, pointing out potential pitfalls, and holding periodic status meetings. These along with maintaining an open door policy will make your staff feel equipped and that they have your support. If you have to micromanage, you have hired the wrong person. The methods you learn here are not one-time tactics, but ideals to be intertwined with your corporate culture. Many employees will spend more time at the office than waking hours at home. The relationships they forge in the workplace become akin to an extended family. Just as it is the employeeâ€™s decision to excel, so too is it the managerâ€™s choice to perform in the same manner. The manger is responsible for the morale of his/her team. It is up to him/her to make the environment a great place to work. Staff members will only be as good as their managers. It is up to that visionary manager, to initiate a culture of creation over competition, of justness over cronyism. This is how effective leaders are born and personnel are motivated to perform at outstanding levels. Copyright Â© 2005-2006 Vicky Therese Davis, William R. Patterson, and D. Marques Patton. This article may be reprinted in its entirety without permission. Let's face it: the greatest accomplishment for a member of the sales community is closing a deal with a skeptic. Many who are proficient at this art agree that it is far more gratifying to convince someone who initially felt your product was not necessary that it indeed is, than to complete what the industry terms an "easy sell." Lucky for us all, plenty of doubters buy products and services everyday. Let us examine eleven of the fundamental techniques used by those who succeed in persuading the worst of cynics. Know it inside and out, backwards and forwards. You should know its strengths, weaknesses, and any proprietary features. Also understand the factors that influence its supply and demand. All of these will strengthen your presentation and help the skeptic make a more informed purchasing decision. There should be nothing that anyone can tell you about what you solicit. You will definitely be asked questions, so be prepared to demonstrate all aspects of your product/service in response. Along with knowing your product comes knowing your prospect. Strive to know all you can about your target demographic and potential clients. Make sure you deal with the decision maker. You should know their purchasing habits, what motivation determines their choice, and how long a buying decision takes. You must understand how your product fits into their overall purchasing strategy. When you know the buying habits of your prospect, you can use it to develop a longer-term sales planâ€”that means repeat business. Put yourself in the most favorable position to get a "yes" by focusing on what most concerns your prospect. You will never be effective selling something you do not believe in, particularly to someone who is already skeptical. Your lack of enthusiasm will be an obvious as you attempt to convince your potential buyer. When you emanate passion and confidence, you break down the wall of doubt the cynic has built. To not be a pillar of strength during your presentation is a sure-fire ticket to an abrupt "no." If you are lucky enough to sell a product you do not believe in, you still lose because you risk killing referral business and losing the trust of your customer. Too often, we give strong pitches with lots of hype and little information. We will say, "If you want these benefits, buy my product." This is done with the hope that a prospect's curiosity about your bold claims will be enough to convince them to purchase. The idea that if you divulge too much information, you could dissuade your prospect is a far too common falsehood. Be prepared to give as much information as needed to convince the potential buyer to make a purchase. Transparency builds trust. Things people do not understand will always be greeted with "no." The more information available when making a purchasing decision, the more likely they are to say "yes." Another benefit of being transparent is the more resources you divulge free of charge, the more likely you are to generate interest in your product/service. By offering endorsements and testimonials, especially from well-known sources that your target market respects, you strike the chord of "trust." Many a skeptic has purchased based on the recommendations of individuals they respect. Secure associations along these lines and look to align yourself with trusted agencies through strategic partnerships. Major endorsements mean less resistance and lots of sales. The structure of your offer can play a key role in building trust and enticing your prospect to buy. There are many variations of each, but incentives and guarantees are great ways to gain your potential buyer's confidence. Guarantees and free trails allow the skeptic to try the product/service before determining if your offer is a good fit. Incentives and discounts are also valuable tactics as they make the cynic feel they are getting a value. People always love the feeling of getting something for free and buying when it is a low/no-risk transaction. By guaranteeing the quality of your product/service, you disarm the skeptic and encourage them to buy. You also communicate an important message that you are confident in what you sell. If possible, demonstrate the differences that make your product/service unique or superior. Contrary to popular belief, the best salespeople not only close deals, they foster relationships. Relationships are more valuable to both you and the prospect than a one-time transaction. For the salesperson, relationships bring repeat business and the ability to cross-market your offerings; increased referrals because you gain access to the prospect's network base, and the ability to charge a premium because of the higher perceived value of your relationship. For the skeptic, relationships help build trust. These bonds let them know they will not be abandoned after the transaction is finished. Ultimately, they are buying a relationship with you and your firm, not the product/service, so approach selling that way. Self-interest is the skeptic's primary concern, so focus on how your product/service solves their problem, fulfills their need, or satisfies their desire. If your prospect is solely bottom-line focused, your presentation should be centered on how your product or service will make or save them money. If your product satisfies a desire, focus on how it fills an emotional void. Emotional selling differs from bottom-line selling because it focuses on feelings rather than metrics. Remember to focus on the benefits that concern your potential buyer; anything else will make a skeptic lose interest and you lose the sale. In life and business, two of the greatest challenges are making intelligent decisions and properly following through on them. One of your fundamental goals as a salesperson is to help people make informed decisions. To do so, ask two types of questions: those to better understand your potential buyer and his/her needs, and questions designed to lead your prospect to buy. A series of well-placed questions will allow you to isolate any objections. You should brainstorm every possible reason a skeptic will not buy from you and comprise an effective solution or rebuttal for each. Any other question should be crafted in a way that allows for only one reasonable answer, and that answer should compel your prospect to agree with you. Your emotional state will be apparent to a skeptic. Never appear as though you "need" a sale. Everyone avoids a hard-pressed individual. Often we are conditioned to give to and buy from those who do not need our money. It is the same principle that makes us more likely give a rich man fifty-cents to make phone call because he has no change, than to a homeless man in need who makes the same request. Therefore, it is imperative that you operate from a mindset of abundance. Understand there is always a bigger sale out there, so you need not be pressed for this one. Your confidence will put the cynic at ease and make them more likely to buy from you. Once internalized, these 11 points will mesh into an effective sales strategy. You will begin to think of them not as individual points to be mastered, but one comprehensive selling technique. They are designed to compliment each other and give you a thorough footing for selling to those who are naturally doubtful about you and your service. Master them and win! For a few, life has improved amongst the terrorist threats and subsequent roller coaster of an economy. Some have bought second or even third homes, while others have elected for collection quality, top of the line automobiles. Others still have traveled the world, experiencing realism at a level the vast majority will never know. Why yes, luxury today is known well in certain circles and is in fact lavished with immoderations. Those who want to be remembered as having made a difference need to lead lives full of actions powerful enough to not only be cherished in their life, but also after they have passed on. Traditionally, these are service oriented acts. Become a mentor to todayâ€™s youth. Help as many others achieve their goals as you can. When you have it all, tell it all. The story of your life should be recorded. This way, you only have to say it once and you will maximize the affect your experiences can have on all the people that read your book. Book writing is always a great project for those needing a new experience in their lives, especially for those willing to undertake its arduous course. More like, refine yourself. Take up Jiu-Jitsu. Learn yoga. Do something you have never done before. Study a new language. Study two. Fly a helicopter. Feed thousands of starving people. Aim for the horizon on this one. If you have ever thought of owning a sailing team, here is where that desire is to be recorded. It is far more difficult to achieve your innermost desires without writing them down. The human brain understands that you are serious when you take the time to write your goals down and review them on a daily basis. Let it all hang out. Studies have shown that 90% of this great nationâ€™s wealth is controlled by 10% of its population. Many find that statistic shocking, while others have come to accept its validity. Some of this 10% are wholly fulfilled by their lifeâ€™s experiences, but there are those who yearn for a bit more. The upper crust possess within it a class of its own, a faction unsatisfied by the trappings their money affords them. Rather, they go through with their day-to-day affairs and wonder if they could get even more out of life. The answer is a resounding yes! We are pleased to have with us William R. Patterson as he talks about his co-authored book, The Baron Son: Vade Mecum 7, that has made several national bestseller lists, is being translated around the world, and is a featured selection in the Forbes Book Club. Irene: The Baron Son is a revealing allegorical tale designed as a road map to wealth, power, and success. Please give us a gist of your book. William: Our new work, The Baron Son, is the story of a young boy who loses everything and through struggle finds the secret to become the richest, most powerful person the world has ever known. Through eleven â€œSupreme Principles,â€� each chapter of the book details how some of the most prominent individuals are able to ethically establish and maintain their positions. The book is based loosely on our experiences as entrepreneurs and also our research in working with a number of Fortune 100 executives across the country. Irene: Give us an example of one of the people you write about and their secret. William: One great example is media mogul, Bob Johnson. He is Founder of Black Entertainment Television and the first African-American billionaire. He was also the first African-American majority owner of a major professional sports franchise, the Charlotte Bobcats. Bob Johnsonâ€™s vision represents one of the key concepts in the book, the â€œSupreme Principleâ€� called â€œThe Seedlings of Empires.â€� This principle illustrates how success is built around one creating value for others by serving a particular â€œneedâ€� in the marketplace, and by having the foresight to recognize exceptional ideas that have the potential to blossom into greatness, and the courage to act on those ideas. While many television networks were competing unsuccessfully for the same market, Bob Johnson created a niche network that served a demographic that had largely gone ignored by mainstream media. In the process, his success, both directly and indirectly, helped generate billions of dollars for companies and individuals, and pressured several industries to transform their marketing strategies and the way they do business. True Barons not only create wealth for themselves and others, but also leave a lasting impact on their industries. Bob Johnson was able to do just that. Irene: The Baron Son was co-authored by two other people, Vicky Therese Davis and D. Marques Patton. What relationship do you have with them? William: Marques and I are Principals in a financial holding company that we co-founded and have been good friends for some time. Vicky and I are former classmates and have done quite a bit of work together on the professional lecture circuit. Weâ€™ve collaborated on a number of writing and training projects throughout the U.S. and abroad, helping children and adults to develop entrepreneurial and investing skills, which coincidently became one of the inspirations for our book, The Baron Son, and has since evolved into our suite of offshoot training programs called THE BARON SOLUTIONâ„¢. Irene: The three of you studied and talked with many successful people in the world. All have a commonality of having some of the same â€œSupreme Principlesâ€� that are revealed in The Baron Son. What are some of the principles that directly affect the business world? William: Thatâ€™s a great question. We wrote the book with a layered approach, so that each principle would be relevant to the reader regardless of their perspective. So, no matter if he or she were an established business leader, aspiring entrepreneur, seasoned investor, or merely a casual reader looking for an inspiring story, they would be able to take something away, not just from each â€œSupreme Principle,â€� but each page of the book. While each â€œSupreme Principleâ€� holds its own relevance and power, it is really the synergy of implementing them all at once that allows an individual or group to maximize their efforts and achieve their desired level of success. However, with all of the recent corporate and political scandals, one of the principles that has particularly resonated with the business community is the â€œSupreme Principleâ€� of â€œRequital.â€� It brings home the importance of ethical leadership and the idea that at some point each individual will be confronted with the consequences of his or her actions, be they good or bad. Irene: Out of the eleven principles you reveal, what are some that are directed toward personal life â€“ a step that needs to be addressed before moving on into the business world? William: One of the things that is unique about our approach and strategy in writing The Baron Son, is that we view both the personal and business aspects of life as interrelated. We encourage people to make it a priority to become business owners and investors either through their passions or while pursuing their passions. I would say the most critical â€œSupreme Principlesâ€� that people should focus on early in their business careers are â€œThe Irresistible Force,â€� â€œThe Invincible Shield,â€� and â€œAllied Effort.â€� The first two focus on establishing your definite purpose and building your self-confidence, which at times will be the only things you have to sustain yourself in the face of tremendous odds and temporary setbacks. The third, â€œAllied Effort,â€� is important because it gives one a basis to establish relationships and strategic partnerships that will be critical to oneâ€™s long-term success. Irene: Establishing a definite purpose is often difficult for people. What tools do you suggest one use to realize their purpose? William: To find your definite purpose, answering the following questions usually helps: What is the one thing or the several things that I have a particular talent for or would do even if I never received a dime as payment? What kind of impact would I like to have on the world? What legacy would I like to leave for future generations? Next, take the answers to those questions and make your goals ten times bigger. Then do your homework, pull together a plan for actualizing your goals, find mentors and a group of competent individuals to help, and continuously check your progress against those goals. Of course, along the way you will need to tweak your plan and objectives when necessary as you and the world will undoubtedly change. Irene: Motivation is a key for being successful â€“ both business and personal. Why do some people lack motivation? William: Motivation is largely driven by emotion and/or necessity. Anytime you are dealing with emotion there are usually a number of factors or influences that come into play, many of them stemming back to childhood, and whether those influences were encouraging or debilitating. A personâ€™s values are also a key component to his or her level of motivation. The more one feels that the actions he or she is taking will bring the things he or she values, be they material possessions or a particular state of being, the more likely he or she will be motivated to take those necessary actions. For a few others, their motivation is driven by a deeper sense of meaning and purposeâ€”a desire to create a needed change in the world or to have a specific impact. As for motivation driven by necessity, that boils down to a basic issue of survival, a need to provide for oneself or family in the face of seemingly few viable alternativesâ€”the feeling that oneâ€™s back is against the wall. We illustrate quite a few these motivating factors through the life of the bookâ€™s main character, The Baron. Irene: Not all people feel they have leadership qualities. Is this true, or, is their thinking based on fear? William: I think that perspective is usually based on a personâ€™s lack of experience in leadership positions. By and large, society and our educational system tend to push people toward being followers. I have no doubt that anyone can be taught to lead in some capacity. The question becomes: Are they willing to accept the burdens and responsibilities of leadership, as well as the moral and ethical obligations? It is also important to note that you donâ€™t always have to lead to have an impact, which is actually what our next book is about. It discusses how one creates value in his or her role as a steward as opposed to a leader. Irene: Stewardship is extremely important, and as you say, everyone isnâ€™t meant to be a leader. If it werenâ€™t for stewards, there wouldnâ€™t be any leaders. What words of wisdom do you have for someone that wants to be a leader, yet their strength is being a steward? William: My advice to aspiring business leaders is fourfold: Develop your vision by studying other leaders in order to learn from their success and failures, as well as their approach to problem-solving and the factors that influence their decisions. As we discuss under the â€œSupreme Principleâ€� called â€œShining,â€� leading others requires you to have a certain depth to your decision-making; that means thinking several deals and years ahead, constantly keeping in mind the changes that are occurring on the social, political, and business landscape. Secondly, build up your knowledge when it comes to the systems and processes in your fieldâ€”technical competence is always key. Third, seek out opportunities to act in leadership positions. This may mean volunteering for or creating new initiatives in order to gain a greater understanding of people and business that only comes through experience. Lastly, learn to â€œlead from the frontâ€� and inspire people through your actions. Nothing moves people more than a leader who â€œwalks the walk.â€� If you do these four things, in time, you will not only be ready for your shot at leadership, you will be in a position to create your own shot. Irene: Relationships and networking go hand-in-hand. You claim that many opportunities are lost or go uncovered because one has failed to cultivate meaningful relationships. In what ways can one step forward and create relationships that would result in successful networking? William: It begins by understanding what networking really is. One of the common misconceptions is that networking is always about you trying to get something from other people, but it is really about understanding the needs of others and connecting two or more people that could benefit from a particular interaction or relationship. The benefits you receive are really a by-product. One can start by making a list of everyone he or she knows and identifying which relationships are particularly important to him or her, and how they would like to grow those relationships. Next, he or she should identify other people that they would like to get to know, particularly those individuals that would compliment or fill voids in his or her business or social network. From there, it is about initiating and maintaining contact to build and cultivate those relationships and helping the others in their network when possible. In the situations where you might occasionally need othersâ€™ help, they will not be as reluctant to give their assistance because you have maintained a relationship with those individuals and have likely helped them out in the past. Networking can be very time-intensive, but well worth the investment. I have seen first hand that it can literally mean the difference between life and death. Irene: Importance is stressed on having personal power. However, to be effective one must take decisive action toward a clear objective. What suggestions do you have in creating clear objectives? William: There are several key points to keep mind when it comes to defining your objectives. They should always be specific, practical, achievable, measurable, and bound by a deadline. It is also important to reward yourself whenever you reach such objectives as a way of acknowledging your accomplishments and encouraging yourself to future success. Irene: Financial difficulties donâ€™t happen overnight, and of course, they canâ€™t be solved overnight either. In your objective opinion, why do you feel people create financial difficulties? William: For most people, itâ€™s an issue of education. If you donâ€™t have the education and training, you are bound to make some serious mistakes with your money, particularly with all the advertising messages saying â€œspend, spend, spend,â€� and â€œcharge, charge, charge.â€� In school, we study every subject other than personal finance, despite the fact that it affects every aspect of existence from our access to health care to education. That is one of the reasons that we make a special effort to reach out to universities, high schools, and various youth organizations because that is where it starts. A teenager needs to understand simple things like if they invest $25 a month from the time they are 15, they are likely to have over $650,000 by the time they retire. I come from a family of entrepreneurs, and my father was very good about teaching us about money and business from a very young age. I understood early on that it was important for me to make my financial education a priority or I would spend the rest of my life working for money rather than doing the things I was passionate about. Irene: What do people who donâ€™t have financial difficulties do different than those that do? William: Well, I think there are very few people who never experience â€œfinancial difficulties,â€� even among the wealthy. They are just a different set of â€œdifficulties.â€� Many of the issues we tend to hear about have to do with a lack of money, but as we also address in The Baron Son, there are just as many, if not more, challenges when it comes to managing wealth, particularly sudden wealth. However, since the vast majority of people are dealing with an issue of lack, I will focus there. In my experience, for most people, it has to do with a lack of education and misplaced priorities. Becoming wealthy is not hard; it just takes time and focus. And unfortunately, most people donâ€™t choose to focus on building wealth until they donâ€™t have much time. And when they donâ€™t have much time, they are often tempted to take on unbridled risk in order to build wealth quickly, which often puts them in a more precarious situation than when they started. People who tend to be successful with money make their financial education a priority, invest early and often, and take calculated risks when appropriate. Irene: What are your solutions for getting out of a financial crisis? William: It really depends on the circumstances and the level of urgency. But regardless of the situation, whether you are dealing with a negative cash flow problem, a bankruptcy or foreclosure issue, the IRS, the settlement of an estate, etc., it is important that you seek out financial advice that is tailored to your particular circumstances with the help of a professional advisor. Having said that, I think that it is critical that individuals focus on becoming as knowledgeable as possible in order to evaluate their advisors and the advice that they are being given. And there are a lot of great resources out there for doing that, and we offer quite a few on our website, www.baronseries.com, and through our online newsletter for pulling together debt reduction, savings, and wealth acquisition plans. Our goal is really to try to help people before their situations hit crisis mode. If we were doctors, our practice would be considered more preventative medicine. Irene: Thank you very much William. Itâ€™s hard for me to stop asking questions, but we need to end this interview. Is there anything else that you would like our readers to know about you and your book? William: In the spirit of our â€œSupreme Principal,â€� â€œAllied Effort,â€� and our desire to always give people much more than they pay for, my co-authors and I have teamed up with over 20 other world renowned experts and international bestselling authors to give away more than $3,631 in free bonus gifts to anyone who purchases our National Bestselling business and personal finance book, The Baron Son: Vade Mecum 7 from The Baron Series website â€“ http://www.baronseries.com. We are extremely grateful that so many of our colleagues and other wonderful people around the world have championed the message of this book, and are very pleased that we are able to share that message with your audience. Irene, itâ€™s been truly a pleasure, and I look forward to our next interview. Until then, I wish you and yours continued success! Las Vegas, NV (PRWEB) March 27, 2006 -- Despite crippling obstacles and massive debt, thousands of young adults are now beginning a new path to financial independence with the help of business gurus Vicky Therese Davis, William R. Patterson, and D. Marques Patton. Building on the strength of their sold-out workshop series and National Bestselling book, The Baron Son: Vade Mecum 7, Davis, Patterson, and Patton are reaching out to empower the next generation of entrepreneurs and investors. Endorsed by notable figures such as billionaire Founder of Black Entertainment Television, Bob Johnson, management expert, Tom Peters, and the CEO of Nasdaq Financial Products, Inc., John L. Jacobs, the author trio provides a new set of learning tools for todayâ€™s youth to develop business and financial mastery. Davis, Patterson, and Patton help young people address and eliminate many of the hurdles and pitfalls they face today, including how to avoid and overcome debt, build wealth with few resources, form mentoring relationships and strategic partnerships, and start their own businesses. The group shares its unique success model with learners worldwide who want to improve their positions in life. Vicky Therese Davis, William R. Patterson, and D. Marques Patton are entrepreneurs, sales and strategic business consultants, who have based their success on the principles in The Baron Son. Vicky Therese Davis is Founder and Chief Executive Officer of Indulgence Jewelry Corp. William R. Patterson is Chairman and Chief Executive Officer of The Warcoffer Capital Group, LLC. D. Marques Patton is President and Chief Operating Officer of The Warcoffer Capital Group, LLC. There will be many times in our lives when we are forced to deal with change, disappointment, and failure. These events should not be viewed negatively, but as opportunities to uncover routes to greater success. Life often presents us with these opportunities, yet they are disguised as obstacles, roadblocks, and detours. If we exhibit keen insight, these â€œobstaclesâ€� will offer us lessons that could be learned by no other means. It is up to us to overcome the emotional let downs and find ways to thrive in the midst of these temporary setbacks. In the face of great challenges, here are a few ways to get you back on track. In order to correct our missteps, it is of paramount importance that we understand the root cause of our failures. Determine if the basis was flawed planning, faulty execution, or competitive pressure. When you understand the cause, it becomes much easier to design an effective countermeasure. Through change, disappointment, and failure, there is a message being communicated; a weakness that is being brought to your attention. Failure is one of lifeâ€™s most valuable teachers. It will redirect your course to more favorable paths. With your analysis, determine if your failure was based on an improper course. Donâ€™t let your ego blind you to the fact that you may need a new plan. Failure often reveals subtle details that can lead you to enormous success on your subsequent attempts. It may be appropriate to change direction. Look for the lessons revealed in your efforts, whether they are success or failure. Evaluate your method to determine if it is still the most logical course of action. Seek to identify and adopt the best practices of the most successful organizations and people. By modeling their behaviors, strategies, and tactics, you follow a proven roadmap to success. Also presented is the opportunity to improve upon their methods and uncover breakthroughs that can help you dominate in your field. Another surefire way to get back on track is to consult with experts in the field. They can give you insights into areas that you might have overlooked. Seek professionals who can help you identify and improve the areas that most directly impact your success. The benefits will far outweigh the costs. A smart way to recover from setbacks and position yourself for future accomplishment is to form strategic partnerships. The right partnership will create a synergy that will multiply the return for all parties involved. One of the key factors to look for in a partnership is someone that compliments you and your organization, whose strengths are your weaknesses, particularly in the areas of your life and business that have the greatest impact. By forming such partnerships you will see immediate returns because you have aligned yourself with experts, making your development time will be much shorter. Often times we miss opportunities because our thinking is too narrow. Fortune favors the bold; think large, be decisive. Thinking big will put you in contact with different types of people that agree with your way of thinking. The relationships you forge are a direct reflection of your mentality. Thinking on a larger scale can also create a different level of interest in your project. Many times it can be easier to raise ten million dollars in funding than one million. Opportunities also exist in a narrow scope. To make advancements, consider the archerâ€™s concentration. By concentrating on fewer, but key areas, you can thrive in the midst of change, disappointment, or failure. Evaluate the areas of your life or business that have the greatest impact on your success and direct your focus there. There will be times where you realize your skill set or the skill set of your staff is insufficient to meet the competitive demands of your field. Therefore, it is imperative that you constantly look for opportunities to keep your skills updated. In your pursuit, determine if your lack of knowledge was a contributing factor to your lack of success. If you donâ€™t update your skills, you will find failure at your doorstep. Others in the marketplace are constantly improving; you must do the same if you expect to effectively compete. Another consideration is: Are you looking for an active or passive interest holder in your business? Do you seek someone who will be involved in the day-to-day management of the company? Many entrepreneurs opt for passive partners to avoid having them encroach on the management of the business. If you elect active partners, it is important that they share the same vision, objectives, and ethics as your associates. When pursuing financial partnerships, you have several options. You can choose investors that will solely provide financing, or you can partner with funding sources that will also offer guidance and help in strategic planning. Silent monÃ«y could be the right choice if you have a seasoned management team and desire total creative control. However, if in both cases you will surrender the same amount of equity, it makes more sense to partner with investors who are well connected and may also offer advisory services. Your ideal partner should also be in a position to help you fÃ¶rm strategic partnerships. This person/organization ought to be able to help you align yourself with people who can assist in growing your business. Strategic partnerships can also bring about needed political affiliations. A major point of contention for many partners is the companyâ€™s growth and exit strategy. Some parties may be content as the owners of a small business, while others seek to franchise or even go public. All parties should be in agreement on how they plan to access the equity of the company, rather it be by salary and dividends, or a substantial liquidity event. The right partner can ease the road and multiply the profÃ¯ts of your business. Whether youâ€™re looking for Ã¯nvestment funds, advice, a complementary skill set, or helpful associations, choose this relationship wisely. Vicky Therese Davis, William R. Patterson, and D. Marques Patton, National Bestselling Co-authors of The Baron Son: Vade Mecum 7, will appear on WHCR - 90.3 FM in New York on Sunday, December 18th, from 2:30 - 3:00 PM EST. Whenever the topic of finance is discussed, it is important to note that everyone's situation is different and that financial advice should be tailored to an individual's particular circumstances with the help of a professional advisor. Everyday our mailboxes are flooded with advertisements, catalogues, and "pre-approved" credit card offers hoping to deplete our savings and draw us deeper into debt. In the latest Survey of Consumer Finances conducted by the Federal Reserve, concern has been expressed that the rising level of debt may become "excessively burdensome to families." Similarly, the American Bankruptcy Institute reports personal bankruptcies are at an all-time high and in 2005, more than 2 million were declared. Debt is a scary place to be; it is emotionally and financially threatening. It limits our ability to meet daily expenses, invest for the future, and creates a long chain of financial difficulties. The strains put on our relationships due to these financial pressures make it imperative that we find ways to effectively deal with debt. Like all problems, it will dangerously compound if we ignore it, so we must confront it head on to positively change the condition of our lives. Permanently resolving our debt situation involves three things: gaining an awareness of the different types of debt, understanding the psychology and circumstances that led to the current situation, and devising an effective debt reduction, savings, and wealth acquisition plan. Investment debt is an obligation that one takes on in order free up funds, generate cash flow, and build wealth. It is the leverage of other people's money (OPM) to purchase assets that substantially increase in value or produce income. A few examples of investment debt include mortgages for rental properties, business loans, and stock margin loans. The best forms of investment debt produce positive cash flow. When debt produces positive cash flow, it generates more money to invest and does not reduce your existing income. Consumer debt is a financial commitment used to purchase items that have no substantial resale value or depreciate after they are bought. Examples of consumer debt include: automobile loans, personal loans, personal lines of credit, credit card debt, and more. It can be wise to buy an item using consumer credit, if the after-tax return on your investments is greater than the interest rate on your debt. With this approach, you have more money available to invest at a higher rate of return. This is a riskier strategy and should only be employed by sophisticated investors. It is also important to note that one person's consumer debt is another's investment debt. The money one expends servicing debt goes to help another build their wealth. Over time, your goal should be to turn the tables. To change your financial condition, you must understand the factors that have led you into debt and position yourself so that you will never return to similar circumstances. Common expenditures leading to excessive debt include automobile purchases, education expenses, vacations, gambling, medical expenses, unsuccessful business ventures, and the frequent purchases of consumer goods and services. In general, we must become better planners and begin to stop thinking of debt as the first solution to our problems. If our debt situation stems from overspending, we must address the emotional state that drives us to live beyond our means. If it is due to unsuccessful business ventures, we must learn to move our enterprise forward through stock offerings, or creative means like partnerships and the bartering of services. If it is from necessary expenditures or emergencies then we must develop the discipline to create special savings accounts and cash reserves. Once we change the way we think about debt, we are prepared to implement life-changing solutions. The most expedient way to deal with debt is through a two-tier approach of budgeting and investing. Begin your financial turnaround by writing down the monthly payment, interest rate, and total amount owed for each of your debts. Once you know where you stand with each of your creditors, attempt to lower your interest rates. This involves calling your creditors and asking for lower rates, transferring balances to lower interest rate credit cards, or more aggressive tactics such as home refinancing, to turn liabilities into lower interest-bearing, tax-deductible debt. Next, create a realistic budget and eliminate unnecessary expenses. Take any free cash flow and use it to pay more toward your highest interest, non-tax deductible debt. On all other debt, pay only the minimum. Do this every month until that particular high-rate debt is paid off. Once that account has a zero balance, use the money you normally would have expended on your monthly debt payment, plus any free cash flow, to pay toward your next highest interest rate debt. Continue this process until all your debt is paid off. It is important to note that if you have savings, you should use it to pay down your highest interest rate non-tax deductible debt. It makes more sense to pay off debt at interest rates of 12-30%, than earn less than 2% interest in a money market or savings account. Also, remember the interest rate on your debt is equivalent to the after-tax return on an investment. So, if you are not outperforming on an after-tax basis the interest rate being charged on your debt, it is more advantageous to pay off your debt. The second aspect of your debt transformation involves investing. In order to effectively manage and overcome your debt, make investments that have a return that outweighs the interest rate on your obligation or that generates cash flow in excess of your monthly debt payment. Because investing can be rather complicated and volatile, it is important that you have as much education as possible in this area. Your first thought may be, "I don't know much about investing, and I don't have the time to learn." Well, you must decide if you are willing to make the time, or choose to work the rest of your life to pay off your financial commitments. Budgeting alone is a much slower solution, so you would be wise to develop a mastery of investing or partner with people who possess such knowledge in order to expedite the process. Seeking the advice of competent professionals is a sound way to shorten your learning curve and prevent costly mistakes. If you encounter an emergency during this period, you may use your credit accounts as your cash reserve. There are many strategies for investing your way out of debt. Some include starting or investing in businesses and buying assets that appreciate in value or generate cash flow. The issue becomes, how do you take advantage of opportunities with little cash and poor credit? The answer to most questions of lack is through partnerships. Though we may not view ourselves as entrepreneurs, we all have viable business ideas inside us. It is up to us to develop those ideas and approach enough people until we find partners who believe in us and are willing to finance or actively participate in our venture. For those who like the idea of owning their own business, but not the hard work it takes to develop one from scratch, there are a number of direct sales organizations that will provide you with business opportunities for low startup up costs and lots of guidance. All of these add up to ways of generating excess cash flow to help pay off your debts and build wealth. The mentality that created your current financial situation will not suffice to solve your debt issues. For most, the financial difficulties we face have taken years to develop, so they will not be solved overnight. As much as we would like to believe, there are no incantations or magical formulas for ridding ourselves of financial obligations, only the disciplined strategies of sound money management and investing. We must remember to deal with the issues that drove us into debt before attempting to implement any strategy. If we do not start with our own thought process, any plan of action will not be effective in the long-run and may put us in a worse financial position. To transform our lives, we must change the way we think about finance and obligations. On the occasions that we do use debt, it should be for the purpose of buying assets, not consumer goods that depreciate or have no value. Vicky Therese Davis, William R. Patterson, and D. Marques Patton (â€œDPPâ€�) are leading sales and strategic business consultants and co-authors of the acclaimed business and personal finance National Bestseller, The Baron Son: Vade Mecum 7. Their work has been translated around the world and is praised by top business leaders and financial advisors and is also a featured selection in the Forbes Book Club. Vicky Davis is Founder and Chief Executive Officer of Indulgence Jewelry Corp. William R. Patterson is Co-founder and Chief Executive Officer of The Warcoffer Capital Group, LLC. D. Marques Patton is Co-founder and President of The Warcoffer Capital group, LLC. Disilgold: What is your latest book about? DPP: The Baron Son is an allegorical tale designed as an ethical road map to wealth, power, and success. It is the story of a young boy who loses everything and through struggle finds the secret to become the richest, most powerful person the world has ever known. Each chapter of the book details how the most prominent individuals establish and maintain their positions. Disilgold: How long did it take you to complete your book? DPP: It took nearly five years and a lot of phone calls, utilizing the art of negotiation with each other, the publishing company, and everyone else on the path to seeing our vision realized. Disilgold: What were the happiest moments you have experienced while writing your latest book? DPP: Weâ€™re all great friends, so for us, everyday was an adventure. The happiest moments came in knowing that we were putting our hearts into something we felt was truly special and that we trusted would change the lives of millions of people around the world. Disilgold: Describe your writing style? DPP: We combine elements found in business, personal finance, philosophy, psychology, and self-improvement, which critics say has made the book successful at standing out against the backdrop of motivational books available today. We wrote the book with a layered approach, so it is never the same no matter how many times you read it. It is also designed so that you can turn to any page in the book and find something of value. If fact, we even do a pick-a-page challenge at our personal finance and entrepreneurship workshops to get people excited about the book and to show and prove its life-changing principles. It is kind of our little magic trick. Disilgold: How did you develop your writing style? DPP: Well the writing style is really just a reflection of us, our thinking patterns and how we approach challenges, as well as our common experiences in business and in life. Our writing style not only reflects the universal values and principles for the attainment of individual success, but those which will also uplift humanity as a whole. Disilgold: Do you have a favorite author of all time or someone who inspired you to achieve your goals as a writer? DPP: Being entrepreneurs first, we were influenced most by some of the great business leaders. You know the Barons: Andrew Carnegie, John D. Rockefeller, J.P. Morgan, Warren Buffet, Sam Walton, Bill Gates, Prince Alwaleed bin Talal bin Abdulaziz, and Bob Johnson. They were/are all people who were able to change industry and the way we live our lives. Disilgold: Where do you see yourself as writers ten years from now? DPP: We should be close to finishing our 7-part series of Baron books, then perhaps launching another series, writing more screenplays, or helping other writers develop and market their work. Disilgold: What marketing tips can you provide to new authors? DPP: Cost-effectively marketing your book is often times just as hard, if not harder, than writing it. Marketing Baron P.T. Barnum said "Without publicity a terrible thing happens...nothing!" It is the same with your book. The idea of â€œif I write a great book, it will sell itselfâ€� is absurd. If you can afford it, hire an outside PR team. Itâ€™s worth it because it frees up your time to do other important things. A good PR team will also have relationships that can make things happen for you a lot quicker. We would also encourage new authors to take advantage of every marketing opportunity regardless of how small. You have short window of opportunity to make your book successful, so utilize it to the fullest. Lastly, look for creative ways to market your book and for other author, product, or service tie-ins. It is this type of â€œAllied Effortâ€� approach that we highlight as a â€œSupreme Principleâ€� in The Baron Son that ultimately creates greater value everyone. Disilgold: What other projects are you working on? DPP: Right now, we are negotiating the rights to our screenplay, CUFFLINKS Â®, a financial drama. Weâ€™re also in the process of writing the next installment in The Baron Seriesâ„¢ which will be geared toward women. Weâ€™d love to do some collaborative works like The Baron Son Meets the One Minute Manager, The Baron Son Meets the Fool, Rich Dad, Machiavelli, etcetera. Disilgold: What are your top ten favorite books right now? DPP: Think & Grow Rich and The Law of Success by Napoleon Hill; How to Win Friends and Influence People by Dale Carnegie; Rich Dad, Poor Dad and Cash Flow Quadrant by Robert Kiyosaki; The Richest Man in Babylon by George Clayson, Entrepreneuring by Steven Brandt; Why Should White Guys Have All the Fun by Reginald Lewis; The Magic of Thinking Big by David Schwartz; The E-Myth by Michael Gerber. Disilgold: When do you write and for how long? DPP: We write anytime, even in the middle of night, but always at least one page a day. Good or bad, thatâ€™s the rule. Disilgold: Do you have a favorite location for writing? DPP: For us, it is more about inspiration. If a situation presents a certain insight, we always have something with us be it a tape recorder, note pad, or cell phone etc. to record the thought. Disilgold: What method did you use to write or organize your book? DPP: The book is organized around 11 â€œSupreme Priniciplesâ€� for personal and business achievement with stories wrapped inside of other stories to illustrate and inculcate various points. Each chapter ends with a summary of the major ideas covered. Disilgold: What three words best describe your writing style? Disilgold: What other hobbies do you pursue when you aren't writing? Disilgold: Are there any hidden jewels or talents that you possess that many of your readers may not know? Disilgold: Where can folks buy your latest book? DPP: The Baron Son: Vade Mecum 7 is available from our website, www.BaronSeries.com, and wherever books are sold. Your readers should also know, weâ€™ve teamed up with friends Mark Victor Hansen and Jack Canfield of Chicken Soup for the SoulÂ®, David Bach of Finish Rich and over 20 other renowned experts and international bestselling authors to give away more than $3,631 in free success gifts with our National Bestselling book, The Baron Son, when purchased through our website. Disilgold: Where can folks meet you? DPP: Weâ€™re always on the road either in the U.S. or abroad. We keep a detailed itinerary on the BaronSeries.com website and of course we encourage our readers and students to continue to send in their positive feedback and success stories. They are a pleasure to read and we love sharing them with others. Disilgold: What have been some of your toughest obstacles as writers? DPP: Getting people to comprehend our vision and support it. Disilgold: Thank you for taking time out of your busy schedules to do this interview. DPP: It was our pleasure, anytime. Welcome to The Baron Series Blog! Welcome to The Baron Series blog based on the National Bestselling book, The Baron Son: Vade Mecum 7, by Vicky Therese Davis, William R. Patterson, and D. Marques Patton.